"Care and nurture a small tribe of villagers in Virtual Villagers." 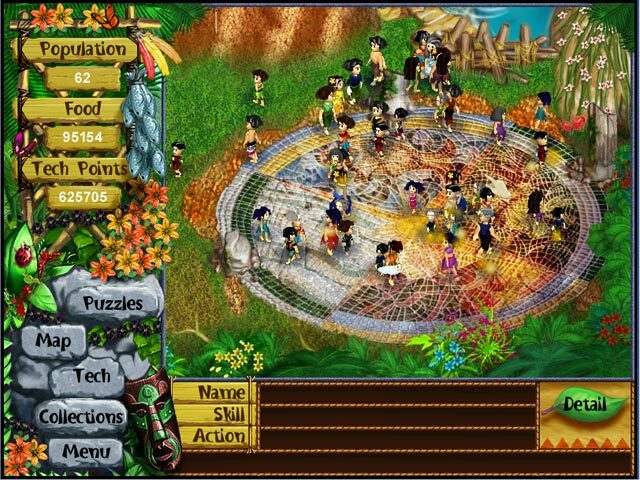 Take care of a tribe in different instances in Virtual Villagers. Care for and nurture different tribes of people by teaching them how to survive in their wilderness. As you play the game, the village becomes larger and larger and you have more villagers to care for. With real time gameplay, you will be able to continue to have new things to do even when you don't play the game. 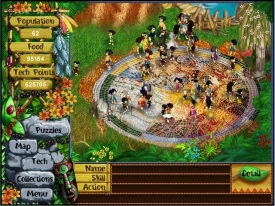 While playing the game, you are required to teach the tribe many different things and ways on how to survive in their world. You will teach your tribes about various forms of food needs, housing needs, and technologies and research so you will be able to keep the tribe safe from diseases and outside risks to the tribe's happiness and life in their world. While you play the game, your village will grow and, depending on how well you teach your tribes of people, they may or may not prosper in the game. As the village grows, your villagers will become smarter and more curious about the world around them and will want to learn more and further advance their knowledge on survival. They will want to know more about survival and the mysterious island that they live on, and will seek this knowledge. You are there to help them succeed in achieving advancement for their own safety. Help these villagers through their daily lives as their protector.